Sign up now for our 2018 summer learning tips, in English or Spanish. A fresh season of mobile tips will begin arriving the first week of June. Do more reading, talking and exploring this summer! Our summer learning tips provide ideas to jumpstart reading, writing, and simple science activities for you and your child. You'll receive 3-4 text messages each week, all summer long. We hope these tips will help you and your kids have a summer full of learning and fun! 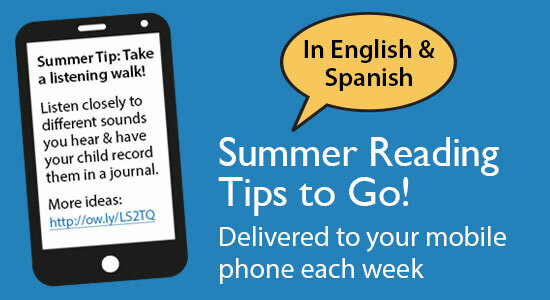 To start receiving our summer literacy texts, simply text READING to 41411 from your mobile phone, or enter your mobile number into the box on the left and click "Subscribe." It's that easy! To stop receiving texts at any time, text STOP to 41411. For help, text HELP to 41411. Standard message and data rates apply, so check with your cellular provider if you have billing questions. Get great summertime ideas for reading, writing and hands-on fun sent right to your mobile phone. ¡Suscribirse a recibir mensajes de texto para ayudar a los niños con la lectura! Recibirá 3-4 mesajes por semana durante todo el verano. Para suscribirse, manda LECTURA a 41411, o introduce su número de teléfono en el cuadro a la izquierda y haga clic en "Subscribe." Responde Y para confirmarlo. Cargos por mensajes y datos se aplican. Para cancelar en cualquier momento, manda STOP a 41411. La lectura de verano es una buena forma de evitar que los niños pierdan terreno sobre lo aprendido durante el año.